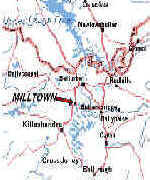 Milltown national school is in the parish of Drumlane, one of the oldest parishes in the area. The name Drumlane comes from the Irish Droim leathan meaning the broad ridge. It consists of two parts: Milltown and Staghall. Milltown (Baile an Mhuilinn - town of the mill) was once called Belnaleck (Béal Ath na Leice), the mouth or gully of the ford of the flagstones. The origin of the name Staghall is rather dubious; the townland is actually called Drumacon (Droim dhá choin, or the ridge of the two hounds). The parish is overwhelmingly rural: Milltown is the only village. The parish has a population of approximately 900 people. It is divided from the parish of Annagh on the east by the river Erne which flows into Northern Ireland. There are two Catholic churches in the parish, one at Staghall where the parish priest resides, and the other at Milltown, served by a curate. There is also a Church of Ireland place of worship at Killynaher. This church, built in 1820, replaced the medieval church at Drumlane. The area is made up of small hills or drumlins, divided by lakes and streams. At one time there were also oak forests, but they were cut down centuries ago. 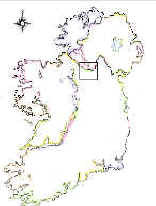 This is reflected in the names of the townlands, the smallest administrative unit of land in Ireland, which can vary in size from 100 to over 300 acres in area, depending on the quality of the land. Click here to go to a list of the townlands in the parish of Drumlane. Some of the meanings are only approximate, because the original Irish name is not known for certain. Many townland names can have more than one meaning.